A couple of weeks ago I shared the story of Susan, and how she quilted a last quilt that was pieced by her friend Carol. The story has touched so many hearts, that another of Carol’s friends has put together a slide show of Carol’s quilts to share as a tribute, and I am honored to share them with you today. You should have seen the emails flying! This is what friends do! If you missed the original post and story, you can find it HERE. Although I am not a quilter, I am a friend and neighbor of the lady who made the My Blue Heaven quilt featured in your July 10 posting, 'Stitched in Love and Bound in Friendship'. I have a wonderful slide show of her quilts and I have made a coffee table-sized photo book of her life's work. Indeed she is growing more frail as time passes and this would be an incredible tribute to her. Thanks for your post. She told me 'I think I have gone viral' and that is what gave me the idea to contact you. I took these photos and I know it would make Carol happy to know that her work is being recognized and appreciated. 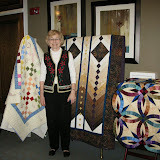 She has completed nearly 200 quilts since she began in 1998 - an awesome body of work! She fell 2 nights ago and is now in a hospice house. You have my and Carol's permission to use this on your blog. Let me know how it works for you. Without further ado, I present to you a slide show of Carol and her Quilts! Click HERE to visit the photo book that Linda made for her friend. Carol, it is an honor and a privilege to have met you, to have spent time with you, and to have shared this wonderful love of fabric and quilting with you! I certainly hope that Carol has made arrangements for her quilts to have new homes when she is no longer able to love them. Beautiful work Carol. What a wonderful legacy. May peace be with you. Wow...beautiful in so many ways...my heart is touched. Heart hugs to Carol and all her friends and family...and to you too Bonnie...thanks for sharing. A wonderful collection of quilts. What a legacy. God bless you ,Carol and all your friends for their love and thoughtfulness. What a wonderful collection of quilts and what wonderful friends to let those of us in blogland see it. Carol has surely spread a lot of love and beauty with her quilts! I am working on 2 quilts to donate to our local Hospice house, where they give everyone a quilt when they stay there. I will be thinking of Carol and her family and friends as I finish and deliver them. What a wonderful tribute to a good friend and talented quilter. Thank you for sharing. What a wonderful collection, it brought tears for me. I could never complete such work they are so beautiful. I love the brown braid quilt on the front picture, particularly as this shows the very talented quilter too. I am sad to read that she is rather ill but it is with love and shear amazement that I send her hugs and all my good wishes. I will pray for her. WOW!! I am in AWE of you, Carol!! What a legacy! I see several quilts that on your table that are on my TO DO LIST!! You have inspired me to get at them!! Thank YOU! My thoughts and prayers go with you! What a talented, delightful lady Carol is. God will be delighted to have her with Him, and I am sending along my prayers to her and her family. She is what I always wanted to become, but I have a long way to go yet. Blessings and Peace coming your way Carol. Beautiful quilts and a beautiful lady that made them. May God be with her and her family/friends,and what ever happens may she find comfort & love. Such a beautiful show! What a lot of loving work into each quilt. Thanks for sharing your photos. Your cardinal quilt was beautiful is there any way to find out the name of the pattern and where it can be found? I hope things are getting a little easier for you and get all the rest you need. Thank you for posting this beautiful tribute. Carol is a fabulous quilter...May God bless you. Great quilts. What a talented and busy quilter. I see the pointed tips on the mariner's compass the perfect double wedding ring. Even so she was very ill she wanted to attend Bonnie's class I find this very inspiring and admirable. Bonnie you touch people's lives. Thank you to all involved for showing these pieces of art to us. All the best to you Carol. I hope to some day have completed half as many quilts! Such variety and such beauty! Thank you for sharing the talent of the wonderful lady with us! Thanks for sharing this, Bonnie ... What a wonderful variety of patterns and techniques! Although we have not met, I will remember Carol as a The Quilting Angel. Thank you fir sharing--sharing Carol, sharing her lovely quilts and sharing the love that binds us together. Peace be will all who are part of Carol's legacy! Carol, you are indeed a rich woman. Rich in talent, friends and in the many years you have had fun making quilts. They are all beautiful. Thank you for allowing them to be shown. You certainly have "gone viral". Wishing you many more smiles and peaceful blessings. Bonnie, thank you for showing us a lady who was dedicated to quilting, and what she achieved. The quilts are gorgeous - a testament to her life and love. Susan is a remarkable friend. Carol was double blessed. Beautiful quilts, what a talent this lady has. What a beautiful Book of Carol's quilts. I have been to the Peaceable Quilters Quilt show in Punta Gorda , Fla.Some of the beauties look familiar. God Bless her. What a great post. Thanks so much for sharing this remarkable story not only of the quilter, Carol, but also her two great friends and you too, Bonnie. Such a great way to start my week. Carols' quilts are so beautiful and I so enjoyed seeing her work. Thanks for sharing. What a stunning array of quilts and what a lovely lady Carol is. I'll be praying for the dear woman's recovery.